NSOF is an unusual venue for mystery writers. Writing for the internet is a particular challenge. NSOF writers are publishing for web readers who are scanning quickly through pages of text. Your message needs to be clear and captivating. Reducing the mystery in your sentences will draw the reader into your story. Running the spell check before you submit writing for any audience is a great first step to proof reading. Have you ever turned on the Microsoft Office “Grammar and Style” option of spell check to help improve your prose? This is a great tool for taking your proofreading to the “next level.” Start using this tool today if you are not already. I bet every writer will see the program pick up a sentence and clue you in that some of your sentences use passive voice. If you are like me, the problem of passive voice multiplies. Once you write one sentence in passive voice, others are sure to follow. So what is the problem with passive voice anyway and why is it best to change EVERY passive voice sentence to ACTIVE voice? Writing a sentence in passive voice usually uses more words. The passive sentence is also less clear and will therefore be less compelling for the reader, especially the reader in a hurry. An active sentence pairs a past, present or future tense verb with a subject. The sentence sounds “active” when you read it. Think about it as “to do.” A passive sentence uses a form of “to be” and the past participle of a verb (usually ending in “ed”). The object of an action becomes the subject of the sentence and it is not clear who performs the action. This strategy could be useful in the witness protection program or someplace where you are trying to be careful not to reveal who was involved. For the NSOF readers, this strategy is not necessary and can create confusion for the hurried reader. The easiest way to improve the sentence is to ask yourself WHO did this? (Who dunnit)? Then rewrite the sentence and put the subject or agent who performed the action early in the sentence and someplace to the left of the verb. 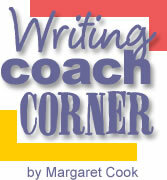 Look at the examples in your grammar program and read the articles and books at the end of this article. Passive – To save time, the articles were written on the computer. The best 100 articles were selected for the book. Active - To save time, NSOF authors write articles on the computer. The NSOF Editor selects the best 100 articles for the book. Copyright © July 2007 – Margaret Cook. All rights reserved.